Heavy construction equipment theft affects rental companies too. Sometimes equipment isn’t returned or a renter provides fraudulent information on the contract. Of course, the theft of rental assets occurs on the jobsite. The 2016 LoJack Corporation Study on Construction Equipment Theft includes rental thefts and recoveries. Download it here. For rental companies, a combination of technology and good customer vetting processes help protect assets. In addition, contracts could provide required and suggested ways to secure equipment on a jobsite. Technology can also help reduce losses from theft. Asset telematics software, such as AssetOutlook™, helps to locate equipment and provides a historic breadcrumb trial to see the path(s) your equipment has taken. It also offers additional benefits such as actual engine hour utilization and data for predictive maintenance. With over $186 million worth of recovered assets to date, as cited in LoJack’s 2016 Construction Equipment Theft Recovery Report, the LoJack® System is an added layer of security for any contractor or equipment rental firm. Now, here are three theft and recovery stories involving rented equipment. Note that Texas is the second top state for equipment theft and Arizona ranked fifth according to the 2016 LoJack® study. The renter of a 2015 Magnum light tower contacted the Dallas Independent School District Police Department to report the stolen equipment. The renter had left the light tower on a jobsite overnight only to return the next morning to find it missing. A short while later after the activated LoJack® System began transmitting, officers from the Dallas Police Department picked up the silent LoJack unit signal from the stolen light tower. Following the directional and audible cues from the LoJack® Police Tracking Computer (PTC), the officers tracked the stolen light tower to a storage facility. They were able to determine which storage room it was in and executed a search warrant. In addition to the stolen light tower, the officers also found a stolen Doosan air compressor inside. They identified the renter of the storage room and an arrest warrant is pending. Per the police report, the Doosan air compressor was valued at $8000. Construction Equipment Guide lists a used 2015 Magnum light tower for over $15,000. According to the LoJack theft and recovery report, towables were 35% of the most recovered equipment with an estimated replacement cost of almost $23,000. 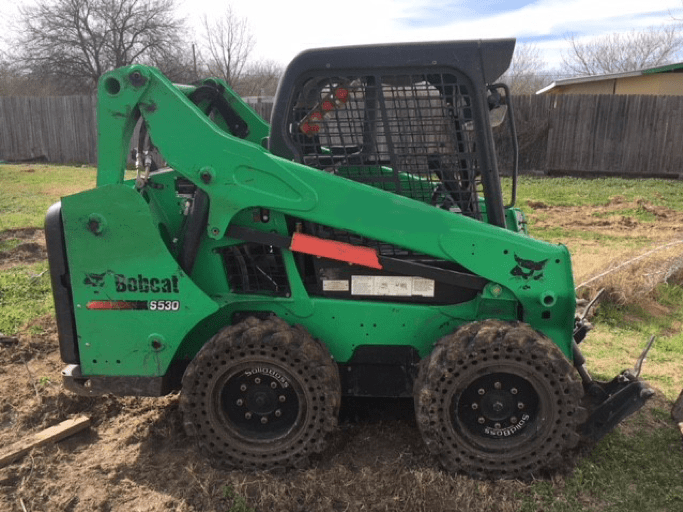 The owners of a 2014 Bobcat skid steer contacted the Houston Police to report their Bobcat as stolen. The owner rented the Bobcat to an individual and later discovered that all the information on the rental agreement was false. The Houston Police verified the theft and entered the vehicle information into the state and federal crime computers, which automatically activated the LoJack® System concealed in the Bobcat. A short while later deputies from the Brazoria County Sheriff’s Office picked up the silent LoJack unit signal from the stolen Bobcat with the Police Tracking Computers (PTC )that are installed in patrol vehicles and aircraft. The deputies tracked the stolen Bobcat to a house in the town of Lake Jackson, where they found it parked in the backyard. The owner of the house stated that he just bought it from an individual and produced a receipt. The individual he bought the stolen Bobcat from is the suspect in an ongoing theft investigation. The Bobcat was in good condition when recovered. The 2016 LoJack study showed that Doosan Bobcat was the top manufacturer stolen, while skid steers were third (15%) for types of equipment stolen and recovered. The manager of an equipment rental company contacted the Surprise Police Department to report the theft of a 2017 Freightliner 2000 gallon water tanker taken over the weekend. The tanker was rented to a construction company and secured at the jobsite. The Surprise Police Department activated the LoJack® System concealed in the Freightliner after verifying the information. A short while later, troopers from the Arizona Highway Patrol picked up the tanker’s silent LoJack unit signal with the LoJack PTC that are installed in patrol vehicles and aircraft. Following the directional and audible cues from the PTC, the troopers tracked the vehicle to an area near Interstate 10 and Watson Road in the Buckeye area. The troopers located the vehicle traveling north on the Loop 303 and conducted a high-risk felony stop. They detained two suspects without incident. The suspects advised that they had paid an employee at the construction site to use the Freightliner over the weekend. The rental company picked up the recovered Freightliner in good condition. Surprise Police Department auto theft detectives conducted an investigation and determined that the two suspects did, in fact, take the tanker without permission. The suspects were attempting to return it to the construction site when stopped by the troopers. The County Attorney’s Office is filing felony charges for the theft. These stories illustrate some of the main dangers to construction rental equipment and heavy construction assets in general. The best methods of protecting them is securing the equipment and jobsite, implementing asset telematics and adding the LoJack® Stolen Asset Recovery system. 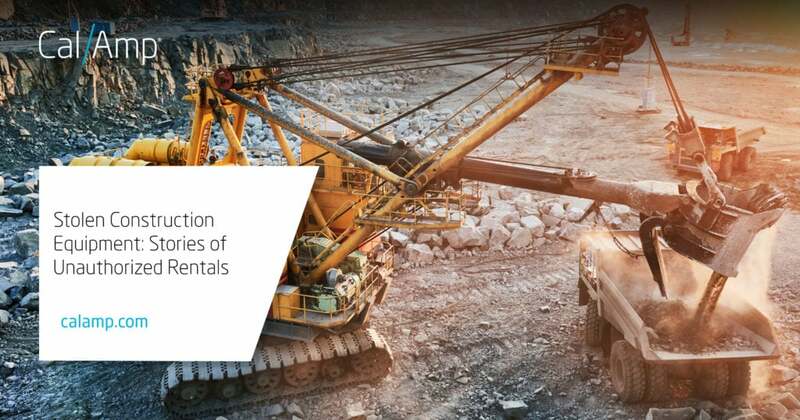 Download the 2016 LoJack Corporation Study on Construction Equipment Theft here and visit our construction solution page at calamp.com/solutions/construction.